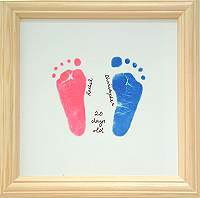 Produce a lasting impression of your baby's hands and feet on ceramic tiles. 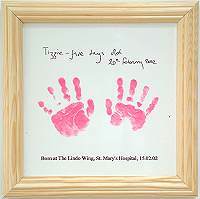 It is a unique record of their early childhood and a colourful addition to any nursery wall. Our easy-to-use kit contains an inkless imprint wipe and specially coated sensitised paper to ensure no mess or fuss. See "How to take perfect prints" for a step-by-step guide of how it can be done.